note: This course may only be taken after successful completion of course 1 or with permission. The goal is to help you get the information so that you understand it, not just to sell you a class. In this way, we present multiple teachings on the same subject to insure the information is heard more than once and really gets into you so it can be utilized. It is suggested to first read the chapter, then watch the video. After that you can re-listen to the audios while you are driving or doing other activities so that you can get the things you might have missed the first time through. There are two recordings (from different years). Often people like to listen to the information again after going through the entire course. You will be reading charts after the course, and therefore listening from a new place. With this in mind all this is offered with each class. A full refund will be granted if students are not happy within 15 days of purchase. After this time the course is non-refundable. These fees include a coach looking at homework and answering questions which pertain to the material presented as well as the final practicum with Freedom. Students are responsible to stay on schedule and finish the program within a 1 year period. For those that can’t finish the course in 1 year, there is an additional $120 fee to complete the course and to have Freedom guide them in the final practicum. 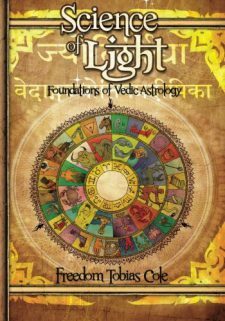 Science of Light Course 2 is a deepening of the philosophy behind the system of Vedic astrology. In this way, there is a deeper understanding of why the principles work the way they do. There is a lot of technical concepts that when understood open up both the spiritual and intuitive powers of the practice of Jyotish. Course two also goes into additional practices such as methods of timing, Ayurjyotisha and remedial measures. We stand to create astrologers that are grounded in Vedic teachings and to upgrade the level of astrology practiced today. We stand to create a strong ground for research that validates astrology in the modern world without losing the spiritual foundations. Planetary calculations are done by Moninder Jheeta.Please be aware that the times are calculated in Pacific Time Zone (PST) for Sacramento, CA (capital of California). If you live in a relatively close time zone you can convert these to your local time zone. The calendar lists the exact time the Moon changes phase (tithi) and sign (nakshatra) as well as the time of sunrise.